Fitness Together has changed my life. Six months ago, after a medical issue, I was in very bad shape. Today I feel great and am in the best shape of my life! Fitness Together’s personal trainers care a lot about you. They listen to your goals and build a customized program to help you achieve your goals. The workouts are a lot of fun and never get repetitive. My trainer Anthony designs my workouts to be a great combination of strength, endurance, and mobility. I look forward to my sessions each week, and my husband tells me I am always in a great mood afterwards. RB Fitness Together has helped me tremendously! After I retired, I decided I needed to focus on my overall health - something that had taken a back seat to my work. This involved changing my daily habits for eating and adding effective exercising into my life. I have never been a gym rat driven to exercise with abandon every day. Being somewhat of an introvert, I dislike open gyms and exercise parlors. I got a full medical evaluation focusing on healthy aging and received a plan to begin a guided exercise program as well as a nutrition program. I discovered Rancho Bernardo Fitness Together in 2007. I was looking for a one-on-one training environment that would help me with my personal fitness and health goals and also teach me exercises and techniques that I could do at home on my own. I found that Fitness Together tailors each workout session to your personal situation. After an initial assessment, they put together an exercise plan to address my needs. I initially suffered from Osteopenia (lower than normal bone density), a higher than desired BMI (more fat than muscle), and low energy. Each week my training plan included weight bearing exercises, cardio, and strengthening of different muscle groups at each session. 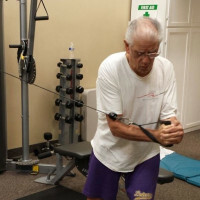 I am now in my 70s and have been working with Fitness Together for over 10 years. I am in excellent health, my weight has been stable for a number of years dropping 30+ pounds from when I retired. My body fat has dropped significantly and my muscle mass has increased. Physically I feel very good, and mentally I feel great. I actually look forward to my workout sessions. As with life in general, the people make the difference. You can quickly tell that the owner cares about his customers. The trainers are all well educated and trained, and really enjoy working with their clients. Some of them are also going to school to become Physical Therapists, or are already practicing Physical Therapists. That is of particular interest for older folk who need help with exercises that will improve their particular conditions and assist with rehabilitation after injuries. I have worked with all of the trainers at one time or another and have been happy with every one. Kudos to Owner Charlie Watson, Sean Hickey, Carmelita Owens, Andrea Sun, Chris Bochen, and also to Diego Velasquez who got me started in the program. I highly recommend Fitness Together for a supportive and effective training environment. I would also encourage prospective clients to look at the Trainers’ biographies and contact Charlie for a consultation. I have been privileged to be working out at Fitness Together for almost two years. Charlie Watson and his team are outstanding and create a personalized routine each and every time. The trainers have all provided me fitness routines to build strength, flexibility, and functional fitness. Because they have physical therapy expertise the trainers are able to specifically address any issues related to injuries and limitations. I have truly enjoyed the challenging workouts and have appreciated that the trainers push me to become stronger and more fit and have built my confidence to know that I can do more than I imagined. I have made significant gains and at 61 I am in far better shape and significantly more flexible than I was when I started at Fitness Together. Sincere appreciation to the amazing team at FT who have greatly contributed to my health and fitness. I was a swimmer in college and I've been fit for most of my life. Working out has never been something I didn't do - I was doing lots of cardio and some weight training, but I was still unhappy with how I looked and felt. I originally contacted Fitness Together in December 2016 because my fiancé and I are getting married, and I wanted him to be encouraged to exercise more. I had a goal for how I wanted both of us to look by the wedding but I didn't know how we would get there together. To be honest, joining Fitness Together was more for my fiancé's benefit, not my own. I would not be where I am today without the amazing trainers and staff at Fitness Together. I know that some of my success is due to my own internal motivation, but the majority of my success is because the trainers here are so knowledgeable, personable, and understands the steps each person has to take to reach their goals. I've asked for particular focus areas and variety in my workouts and they always deliver! They are absolutely incredible and this studio goes above and beyond to make their clients happy, healthy, and FIT. Not only are the trainers incredible at what they do, but they are also incredible people. I always have so much fun at workout because we talk about our commonalities and connect on a deeper level which is different than any other gym I've been a part of. Thank you to my amazing trainers (shoutout Charlie and Sean), and I can't wait to see where I am in another six months time. I've been working with Charlie and his team for 6 months and they've had a tremendous positive impact on my health and my relationship with exercise and maintaining a healthy lifestyle. Before joining Fitness Together I would describe myself as 'exercise averse' and struggled to maintain a regular routine, so after reading many positives reviews and being pushed by my Fiancé to give personal training a try, I decided to give Fitness Together a shot and I'm very glad I did. In the months since I've dropped weight, reduced my body fat percentage and as trainer Sean would say, seen some serious 'gainz' in muscle. Most importantly though I enjoy it. The team at Fitness Together are a pleasure to work with and make your workouts fun. They take great care getting to know you, your goals and understanding your weaknesses and injuries from the past and will always have a program to help you improve. I've now been coming three times a week for the last six months and the difference for myself both physically and mentally are simply fantastic. If any of you are reading this, and the exercise aversion resonates with you ( and for many I'm sure it will! ), go into Fitness Together, talk with Charlie and team and see what they can do, you won't regret it! I am a 75-year-old stroke survivor. The stroke was 20 years ago, and left me with some weakness and tightness in my extremities, plus limited my range of motion. I have been a client of Fitness Together for more than 6 years, working with several trainers over this period of time. What attracted me to Fitness Together, rather than a neighborhood gym, was the one-on-one personalized trainings, and the quality of the trainers. They are experienced and educated in exercise, fitness techniques, and body mechanics, and I trusted their ability to improve my physical well-being. They designed a custom program for me, taking into account my limitations, special needs, and goals. In addition, they have suggested exercises I could do at home to supplement my trainings. I have seen an improvement in strength, flexibility, and range of motion, plus my increased core strength has eliminated the back pain I used to occasionally experience. My doctor is pleased with my health, and told me to continue my personal training. I am grateful for Fitness Together's help in improving the quality of my life. I decided in February that I needed to lose weight, tone and keep my muscle definition. I weighed 218 lbs. (my all time highest weight). Initially my goal at Fitness Together was to gain muscle mass with heavy weight training. I was successful but the extra calories I was eating to assist in attaining my goal also put on extra fat. I needed to change my approach! I currently weigh 195 lbs. and I have lost 23 lbs* in 6 months and lost more than 2 inches from my waist*. Overall I am feeling better about myself and how I look! I have maintained my strength with the variety of training by setting SMART GOALS to ensure success and build confidence. "Thanks to Charlie for the encouragement!" "Four years ago, I had my right knee replaced. I prepared very little and the recovery was typical and arduous. When it came time to replace my left knee, I decided to better prepare. I enrolled in Fitness Together and started working with Charlie 6 months before my scheduled surgery. Charlie took great care working around my damaged and soon to be replaced left knee. My surgery date came and the knee replacement went very well. I was in better condition, going into the surgery, than I had been in years. Recovery was very quick and I began working with Charlie about 4 weeks after surgery. My knee was tender but doing very well and the strength in my leg was returning quickly. In a little over 2 months after surgery, I was doing lunges. Fitness Together has changed my life. I thought after working in healthcare for thirty years I knew everything about diet and exercise. With the help of the trainers at Fitness Together I have lost 30 lbs*. and I am healthier then I have ever been. The trainers are so knowledgeable, professional and patient. Through their expertise I am healthier, physically and mentally. I look forward to many years with Fitness Together.